Here's a really quick card I made for my nephew's birthday last month. He is a hunter extraordinaire, always has been, most likely always will. 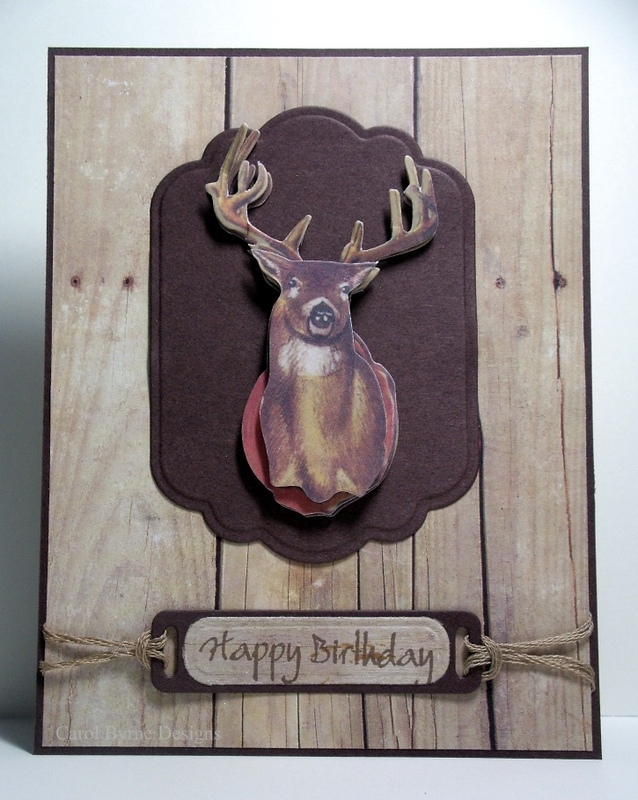 Found this buck in a pack of dimensional stickers from K & Company and knew it would help me make the perfect card for him. Used a nestie for the 'mount' and sentiment, and some really OLD wood patterned paper for the background. Added a little twine to make the sentiment more interesting. And that's it! Easy, peasy! Excellent card. Love the PP and you have given me an idea for a dear friend's hubby's B-day card this year. Same date as mine so I never forget it! I love this! My brother and nephew would both go crazy over this card - they are both big hunters also. I love how you did the twine on the sentiment! Thanks for visiting my blog and leaving such kind comments! Perfect card for your nephew! I know he loved it.